Well, I thought we would drill two boreholes today....But life is full of surprises. 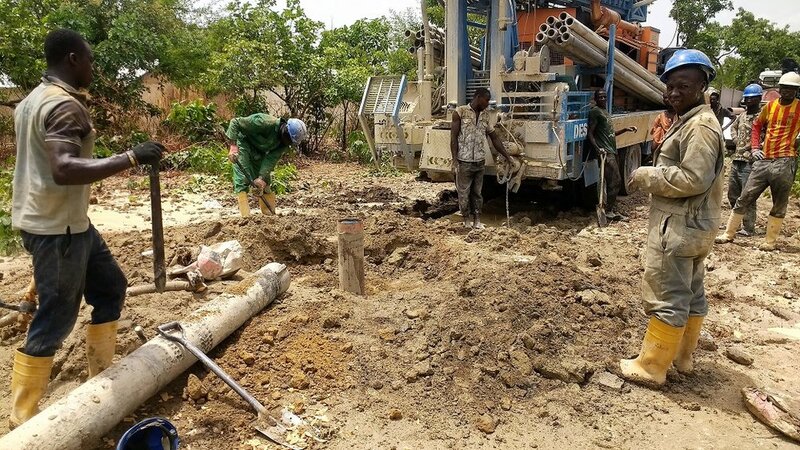 Last night, we had left the drill site at 8:30 pm, as the men were pulling the 9" protective pipe from the hole, getting ready to cap the well and get some rest. Little did we know that one section of the pipe came loose from the rest, and stayed down there, many meters inside the ground. It took the guys till four o'clock this afternoon to finally get it out. They had to dig down to it, a wide hole through very hard, rocky ground, to a point where they could attach a cable around the lip of the pipe and draw out the remaining sections. I did go with Salihu through Block 2, to identify and mark all water sources for the purpose of planning the paddocks. The leaders are working on that. We'll meet with the herdsmen on Block 2 and start rotational grazing when we get back from Garbagal. I also had a great conversation with one young Fulani man regarding the school situation in Kachia. He said that there are so few teachers because those are all the government is willing to pay, but here's the good news! Fulani grads in this reserve volunteer their time and assist the government teachers! The community pays them a small amount to help with transportation! Awesome! I'm so impressed with Kachia reserve. The Fulani here are peaceful, educated, hard-working and progressive. It's a joy to work with them!